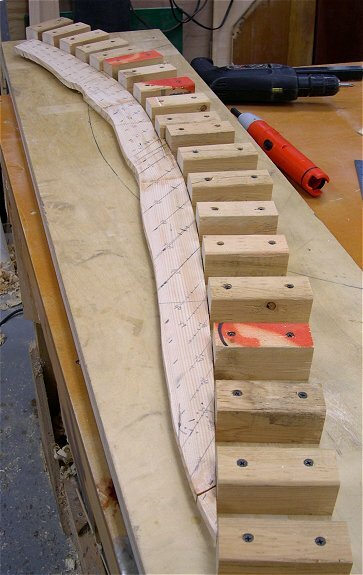 Bridge roots can be custom laminated from physical patterns. You can either supply a pattern you have made from new scaling, or from the original bridge if scaling will not be changed. 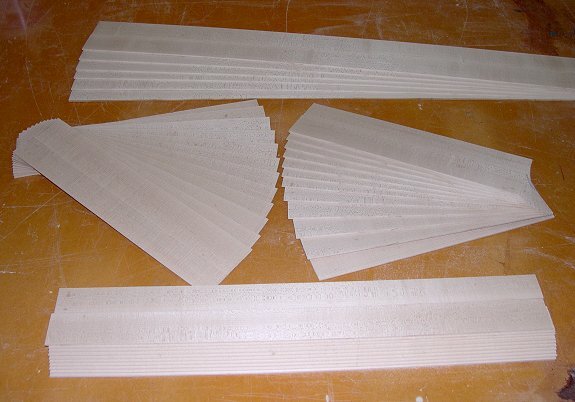 Or, bridge roots can be laminated based on a drawn pattern. Here we see the laminates for a treble bridge getting a dry test fit. 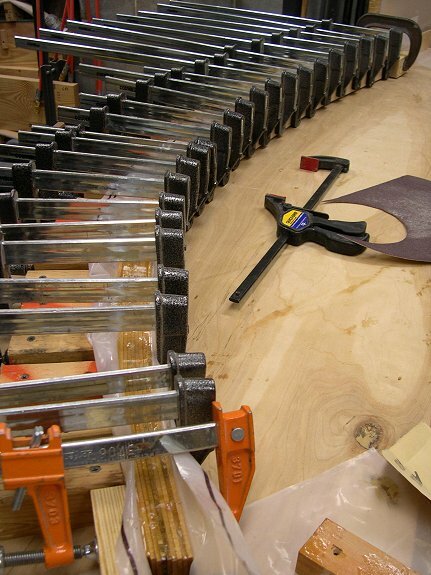 Laminates are bent to shape and bonded together in a trough of epoxy. 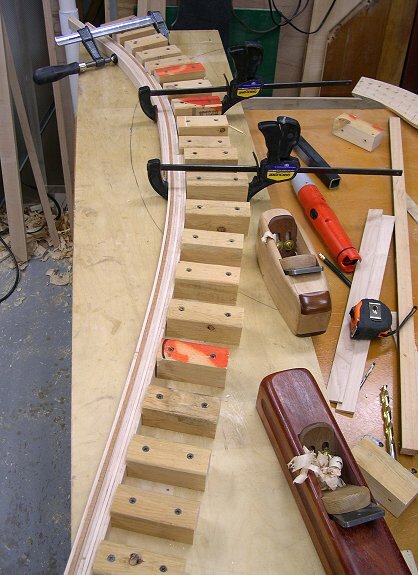 Shown here are two treble bridges, two transition bridges and two bass bridges. All are raw, i.e. having been removed from epoxy-clamping/forming and seeing only minimal cleanup. 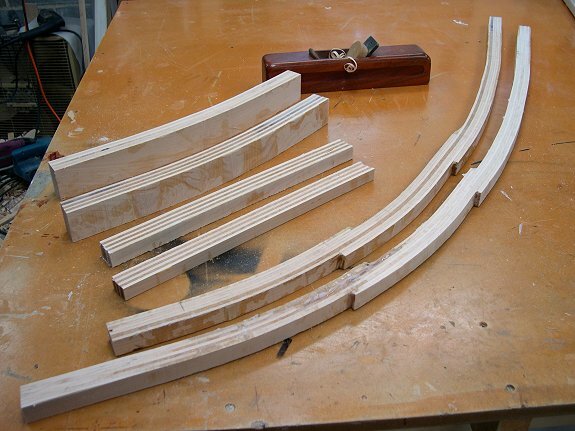 If you prefer to do all the final trimming and shaping on your bridges, you can order bridges at this state of completion. This is a picture of a finished treble bridge root that shows how I can handle even very tight bridge doglegs. 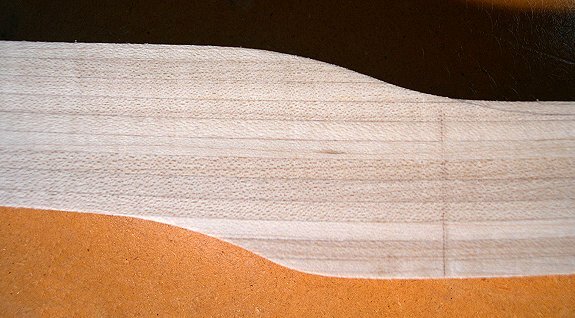 You can see here how the bridge root lamination terminations appear at a dogleg. 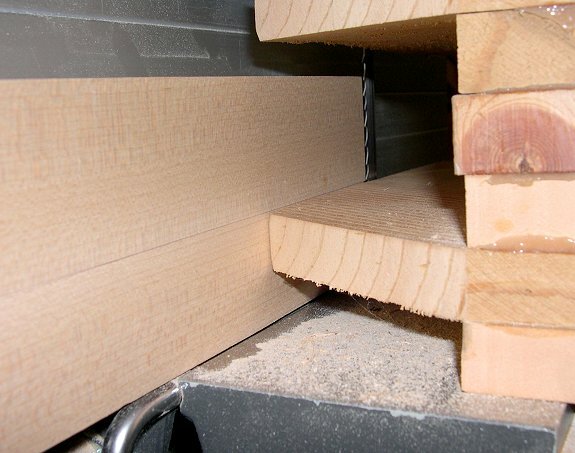 Laminated bridge cap laminations are perfectly quarter-sawn from clear, tight-grained, hard-maple. 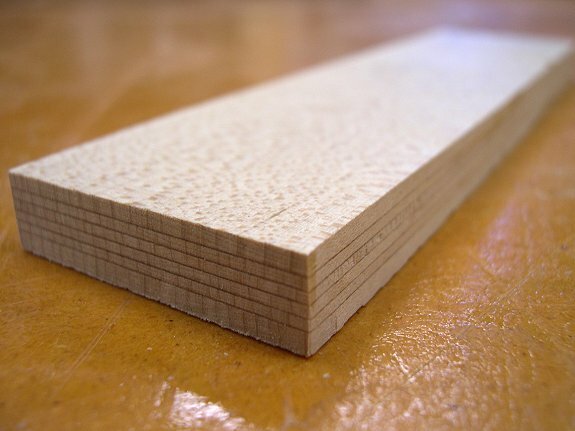 I usually join two flitches of maple together to form a four-inch-wide board of cap material to cut the laminates from. 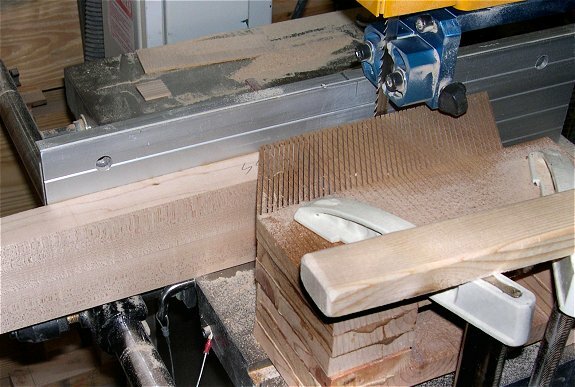 This technique allows me to maintain the perfectly quarter-sawn quality across the entire laminate. Another view of the critical resawing that is done to produce the bridge cap laminae. 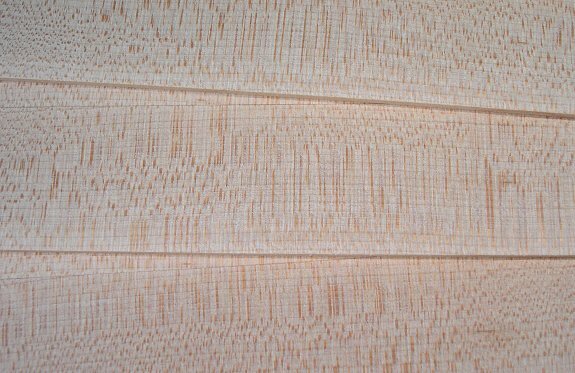 Now these are quarter-sawn bridge cap laminae! An assortment of nice bridge cap laminae ready for epoxy. Cross-section of a finished laminated bridge cap. Note the perfectly vertical grain of the quarter-sawn laminae. One of my laminated cap installed on a piano. 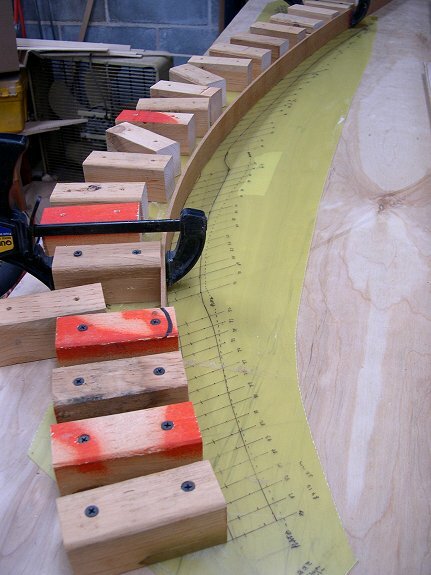 Because the epoxy lines are kept to a minimal thickness and the laminate grain direction is only slightly skewed, notching is barely any more difficult than with solid caps. 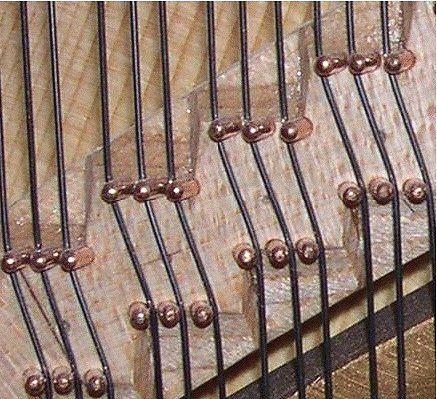 Please contact me to discuss how Farrell Piano can craft bridge roots and caps for your restoration project. All contents copyrighted ©2004 by Farrell Piano and Sarah Fox. Clean & Clear web page design by Sarah Fox.